So how's your Monday going? Are you as exhausted as they look? 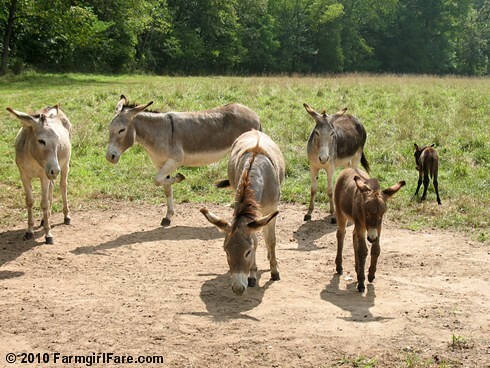 © FarmgirlFare.com, the late night, late start foodie farm blog where I have never seen a farm animal more capable of looking hungover than a donkey. There's more proof here if you don't believe me. 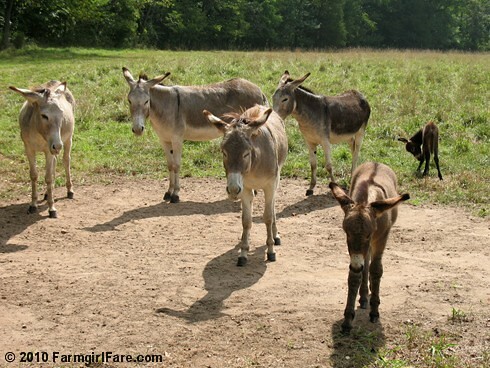 That's a lot of donkey cuteness going on there! so adorable and the potential for friends looms large!! Looking at them makes my heart happy! Wow you weren't kidding about the size difference in the two little boys. Great pictures. That's hilarious, they do look hungover! And what a great gang you've got--congrats on the sweet baby boys! Too cute! Especially the new borns. Why so many adults? Are they guard animals? Farms around here (E. Tn.) put them in with their goats. Actually they resemble my son and his friends, who had a bad movie "watchathon" at our house all weekend. The boys were having a little trouble holding their ears up on Monday morning also.